The Unity Digital Gold and Diamond Industrial Secure Digital (SD) card v3.0 is fully compliant to the SD Card Association specification. Specifically, the Command List supports [Part 1 Physical Layer Specification Ver3.0 Final] definitions. And the Card Capacity of Non-secure Area, Secure Area Supports [Part 3 Security Specification Ver3.0 Final] Specifications. 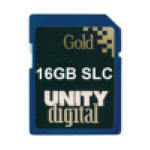 The Unity Digital Gold Industrial SD v3.0 card is based on 9-pin interface, designed to operate at a maximum operating frequency of 50MHz. It can alternate communication protocol between the SD mode and SPI mode. It provides data error detection and correction with very low power consumption. Capacity ranging from 1GB to 16GB.